Forming part of the popular Royal Buildings Shopping Centre, a short distance away from Penarth Town Centre and having rail and bus services to Cardiffaround the corner and virtually opposite respectively. Penarth Promenade/Sea Front, with restaurants and pier, is a popular destination for visitors to the town and again is readily accessible. The four storey plus part Basement/Lower Ground Floor property constructed prior to 1900 and comprising a large double fronted shop (used as a Betting Office) and small Kiosk on the Ground Floor, with seperate entrance leading to the three flats on the Upper Floors. The flats require upgrading to meet fire regulation standards and presently lack central heating systems. The Third Floor Flat (No.3) is presently vacant and cannot be re-let until the Energy Performance rating is increased from "G" to at least level "E". The First Floor Flat (No.1) has an Energy Performance Rating of "F" and therefore improvement works are required to increase the rating to at least "E". Constructed of solid brick walls, with feature rendered panels and mouldings to the Upper Floors on the front elevation and set under the original pitched slate roof, incorporating twin dormer windows with pitched roofs to the front slope. There is a single storey extension to the front elevation set under a flat roof. A small lock-up shop with narrow display windows alongside the entrance door. Use of W.C. on First Floor Half Landing. Let to Peter and Jenny Ford under a lease dated 27th October 2008 - Holding over at the reduced rental of £185.00 per calendar month exclusive of rates. Lessees responsible for internal repairs and decorations plus external decoration of the shop front (subject to restrictions). A double front shop with central entrance door. 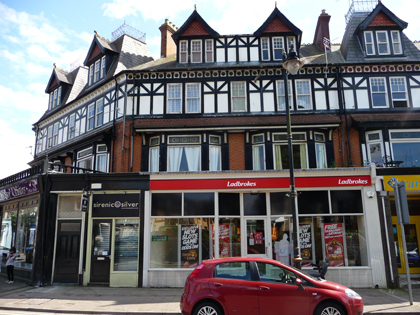 Let to Ladbrokes Coral Group under a Lease dated 28th April 1997 - Holding over at a rental of £6250.00 per annum exclusive of rates payable quarterly in advance. 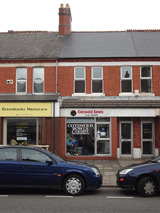 Lessee responsible for internal repairs and decorations plus maintenance and repair of the shop front. The Lessee also reimburses 30.83% of the annual building insurance premium. Electric meters for the three flats. Door leading down to the Basement/Lower Ground Floor Room (with door giving access to the small enclosed rear yard). Staircase leading to the upper Floors. Comprising an Entrance Lobby, Living Room with door to Front Double Bedroom, Rear Kitchen and Rear Bathroom / W.C.
EPC Rating - F (21). Works need to be undertaken to raise raise this rating to at least level E.
Let on an unfurnished basis to Anthony John Jones under an Assured Shorthold Tenancy Agreement for a term of two years from 4th May 2017 at a rental of £475 per calendar month exclusive. Comprising an Entrance Lobby, Living Room, Two Bedrooms, Kitchen, Bathroom and Seperate W.C.
Let on a protected tenancy to Mrs June Hart at the registered rental of £101.00 per week exclusive. The registered rental has been effective since 12th August 2017. Energy Performance Rating - G (11). Works need to be undertaken to raise this rating to at least level E.
The Flat is vacant as it cannot be re-let until the Energy Performance rating is increased to at least level E.
This home's performance is rated in terms of the energy use per square metre of floor area, energy efficiency based on fuel costs and environmental impact based on carbon dioxide (CO2) emissions. The environmental impact rating is a measure of a home's impact on the environment in terms of carbon dioxide(CO2). The higher the rating the less impact it has on the environment.